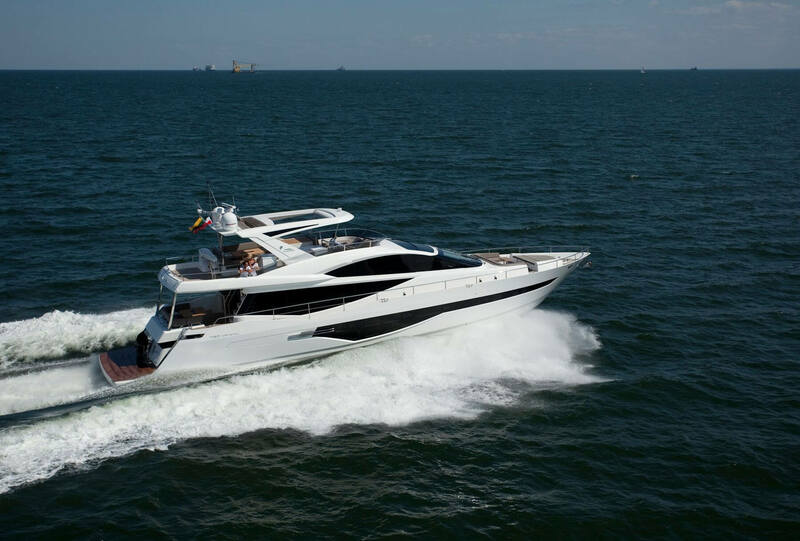 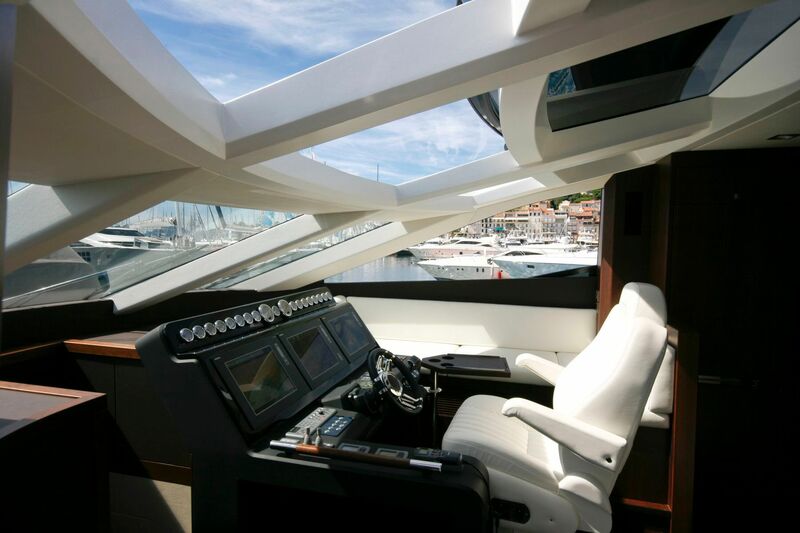 The stunning exterior, a combined effort of the Tony Castro Naval Architects and Galeon designers, offers an abundance of space on all three decks. 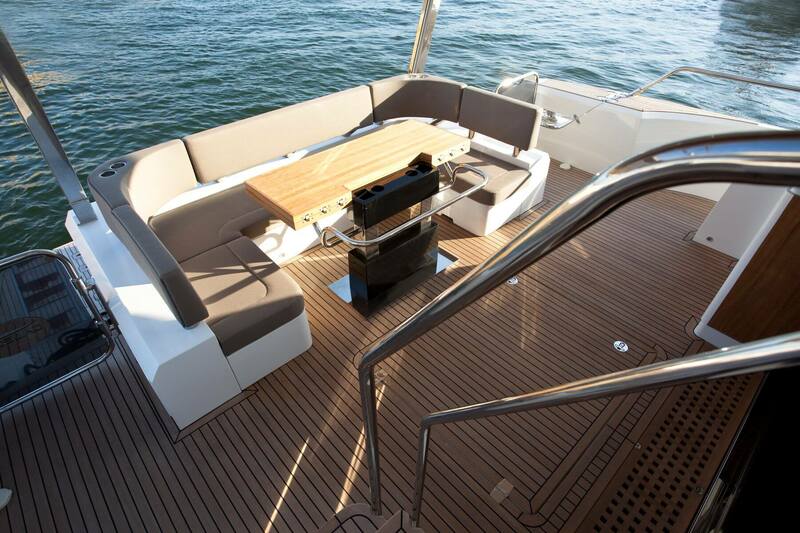 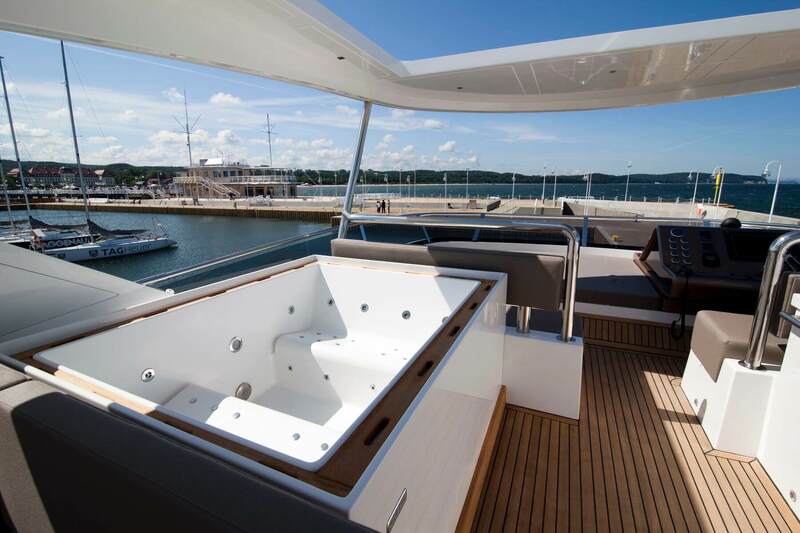 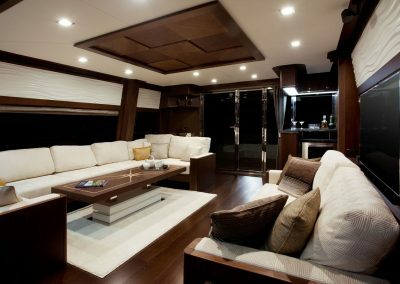 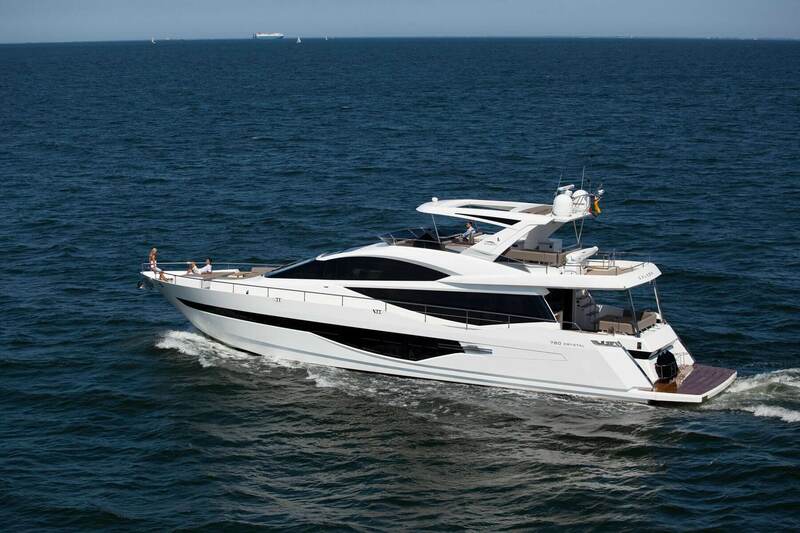 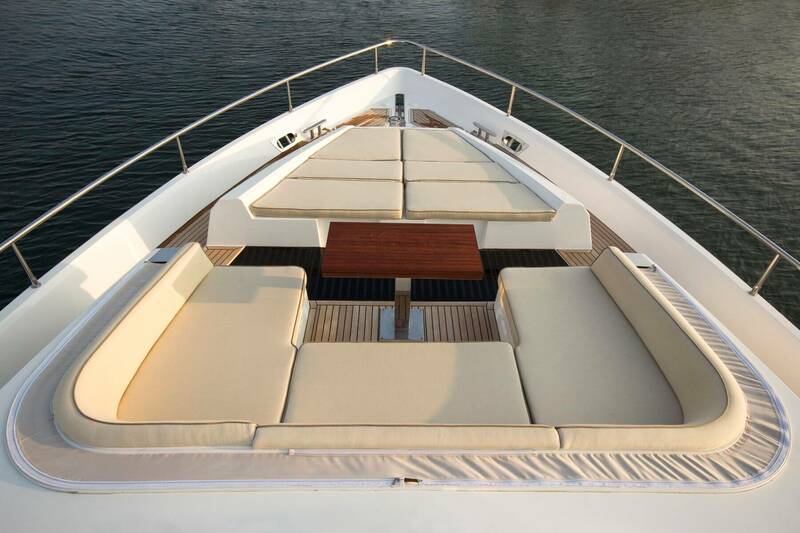 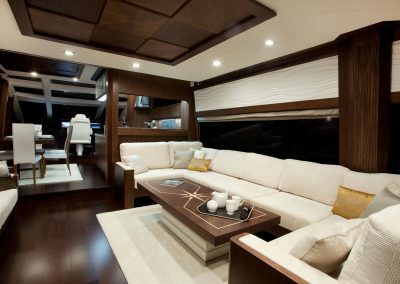 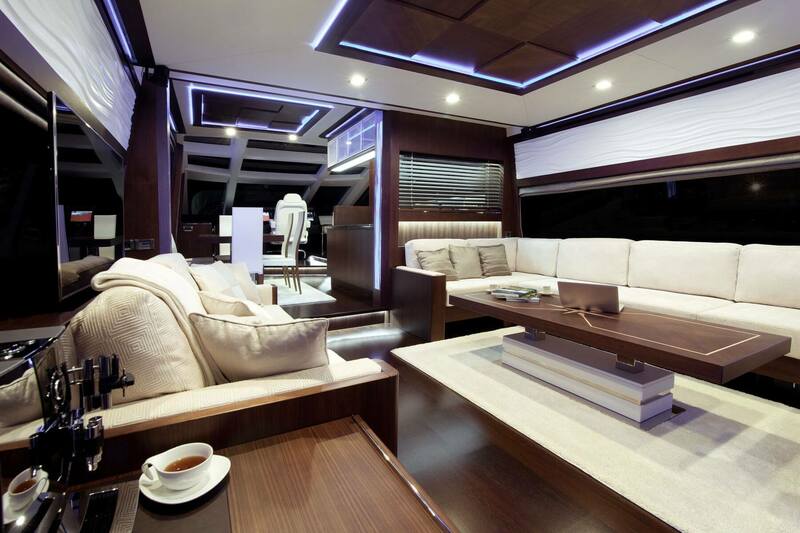 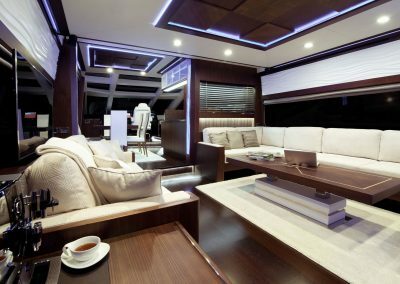 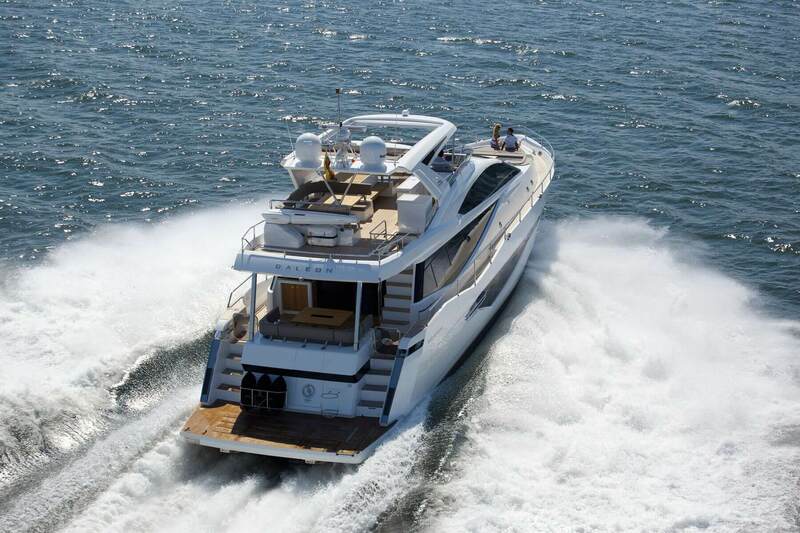 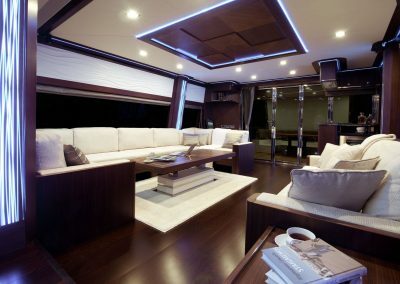 The clever seating arrangement on the flybridge allows for the placement of an optional Jacuzzi, comfortable sunbeds, second steering station and a wet bar for the guests to enjoy. 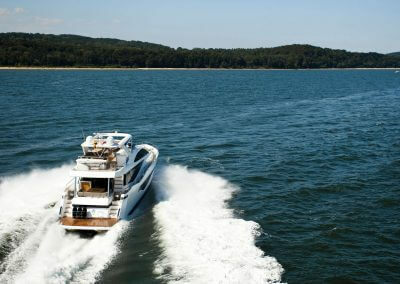 A powerful crane will allow for a RIB or a personal watercraft to be placed at the back. 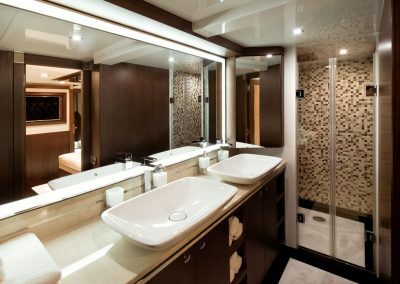 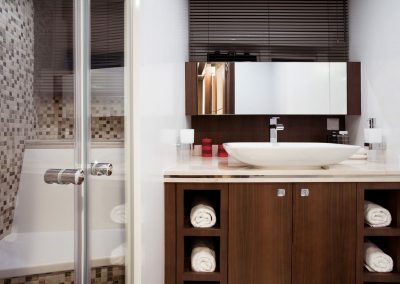 Below, all four cabins have private in-suite bathrooms for extra comfort and privacy. 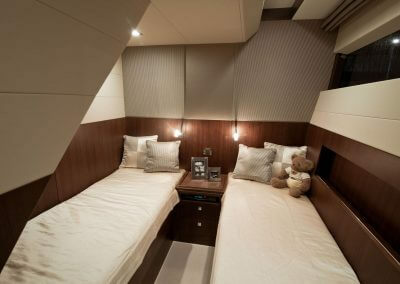 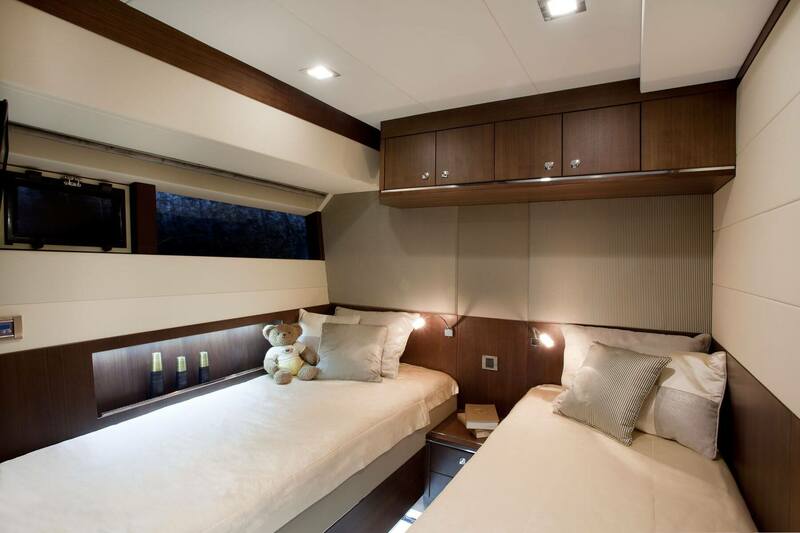 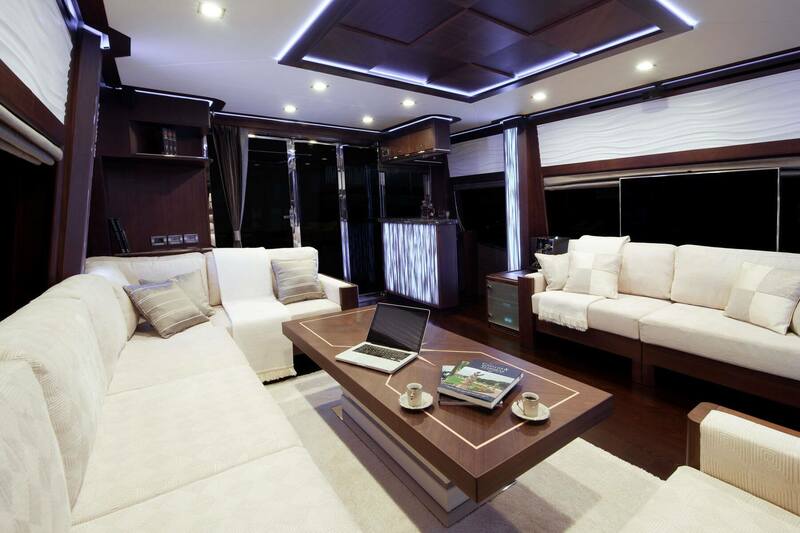 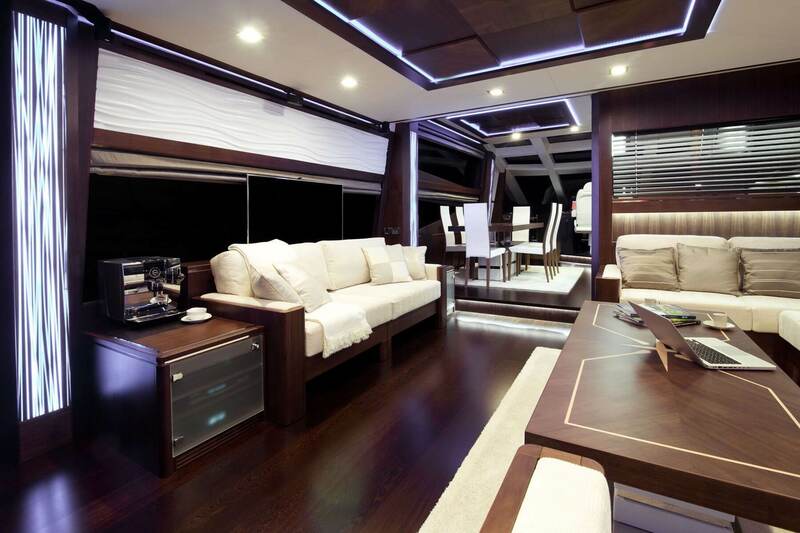 The owner’s cabin with a double bed also holds a massage sofa and a safe for valuables. 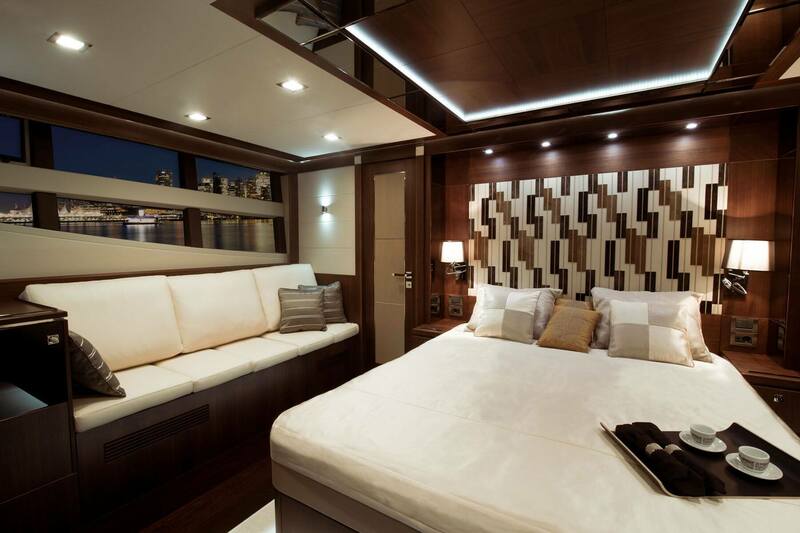 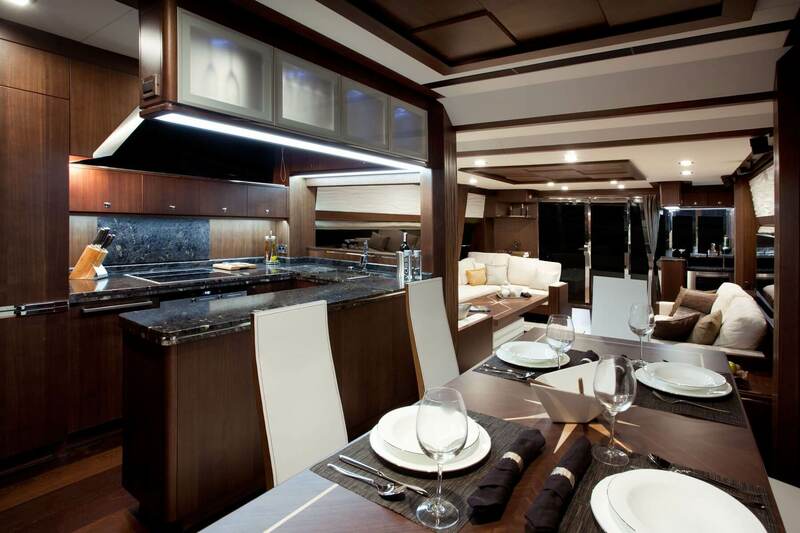 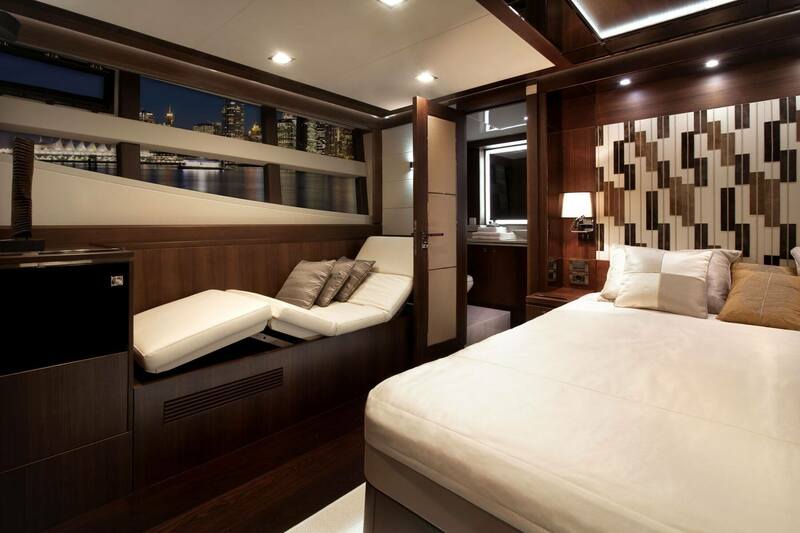 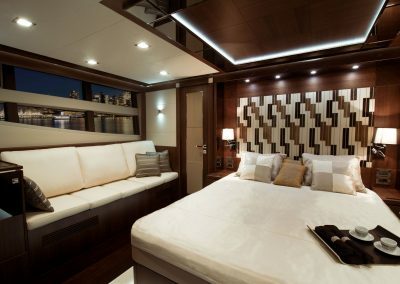 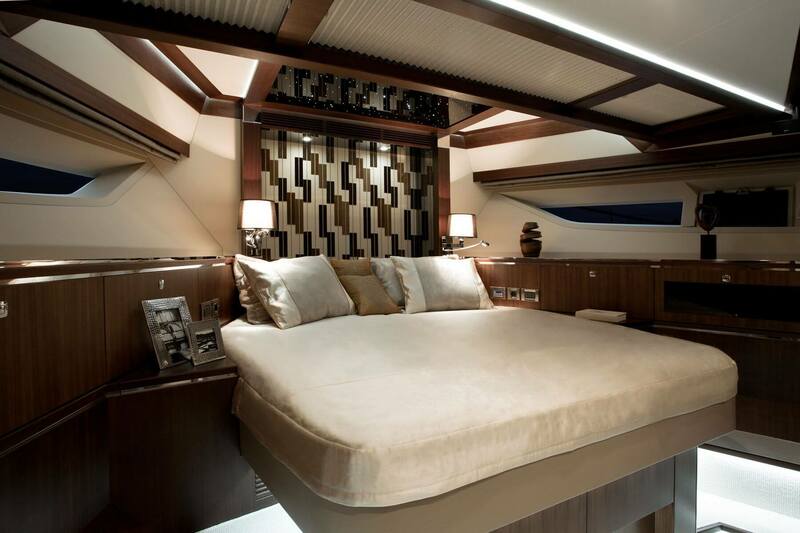 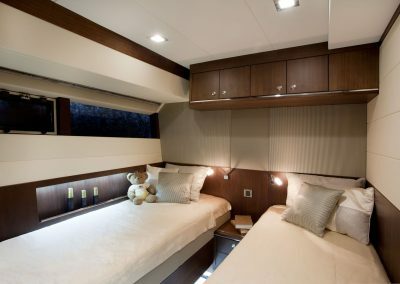 The spacious forward VIP cabin offers a variety of closets and storage spaces while both guest cabins, which are located at the sides of the yacht, have twin berths for a total of eight on the lower deck. 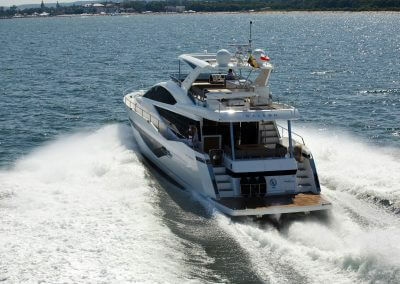 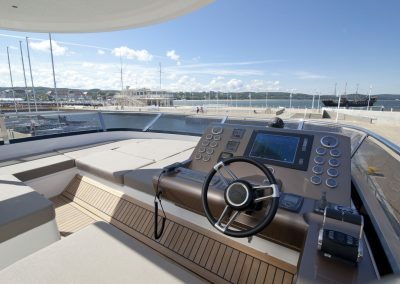 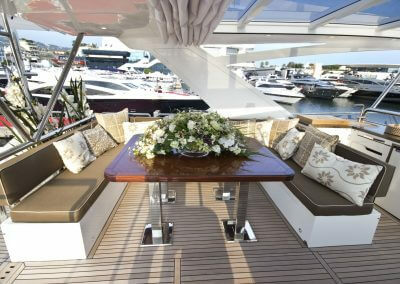 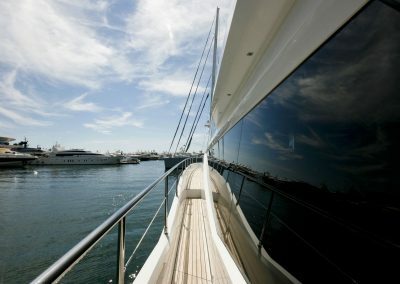 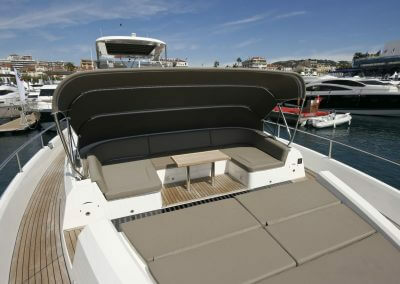 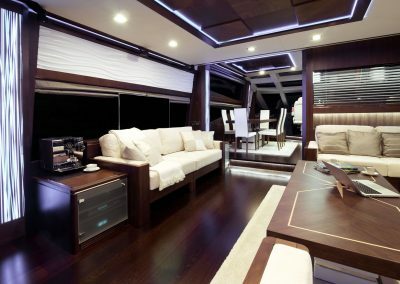 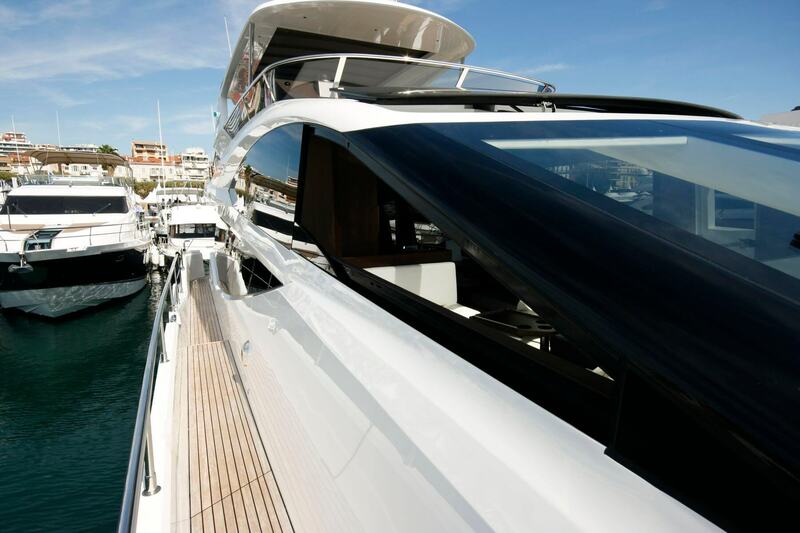 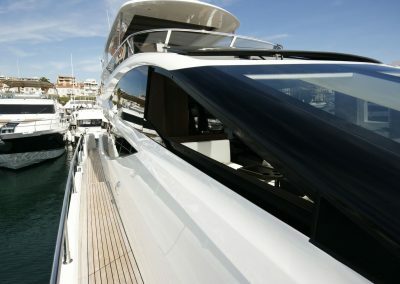 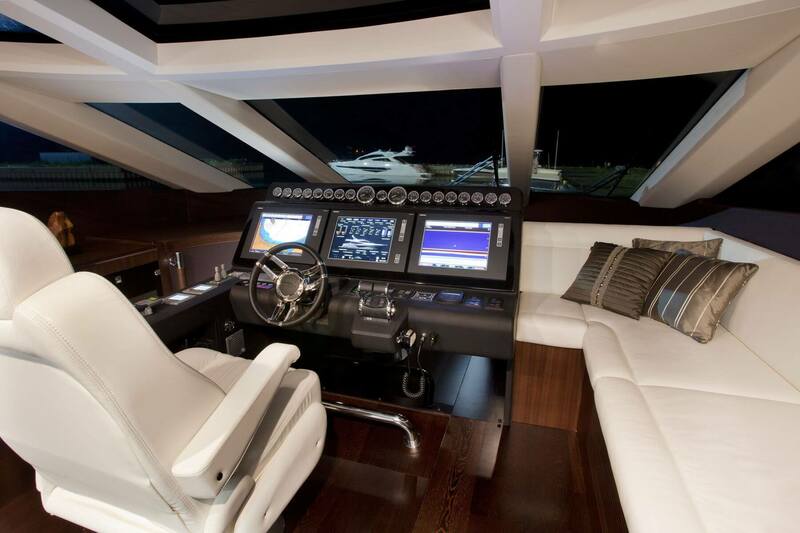 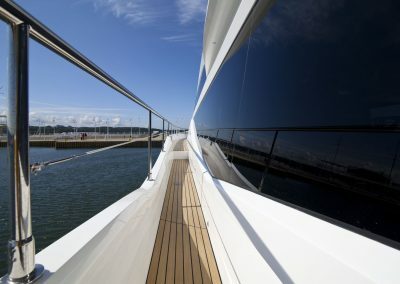 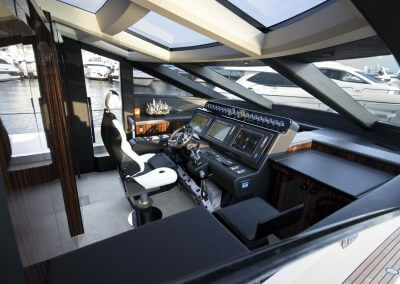 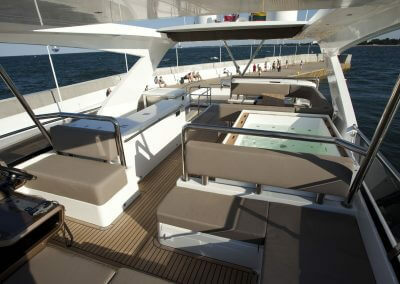 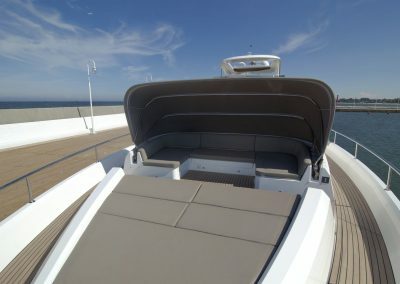 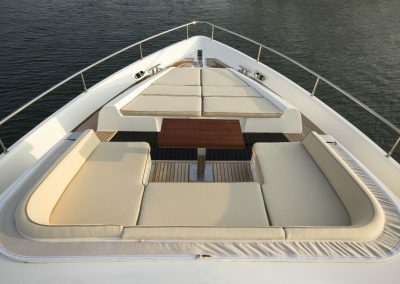 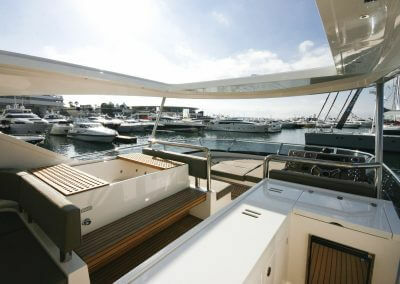 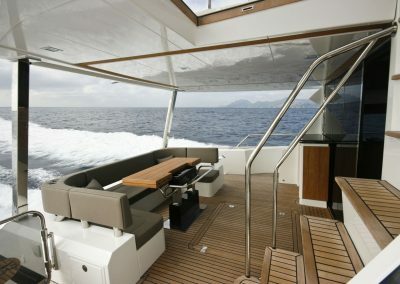 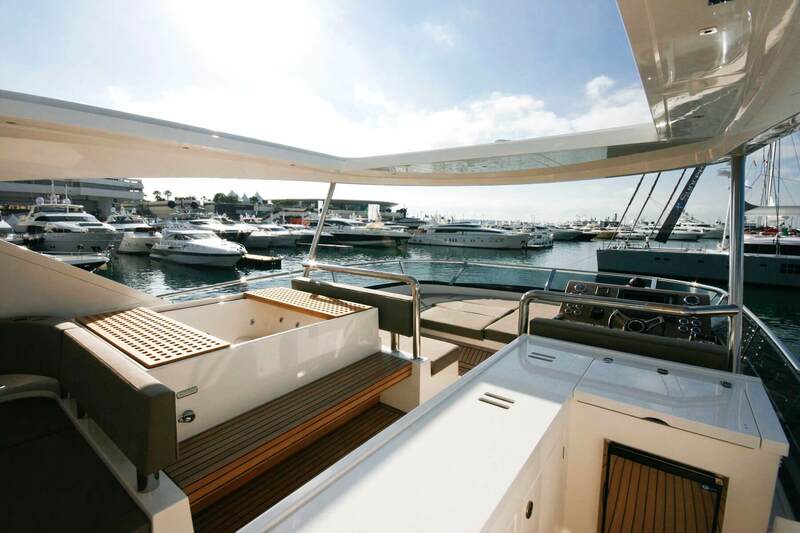 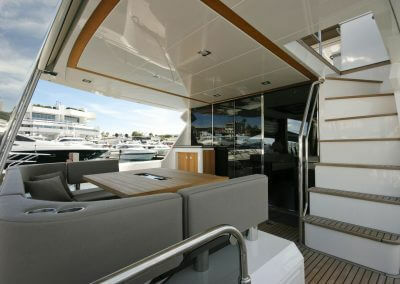 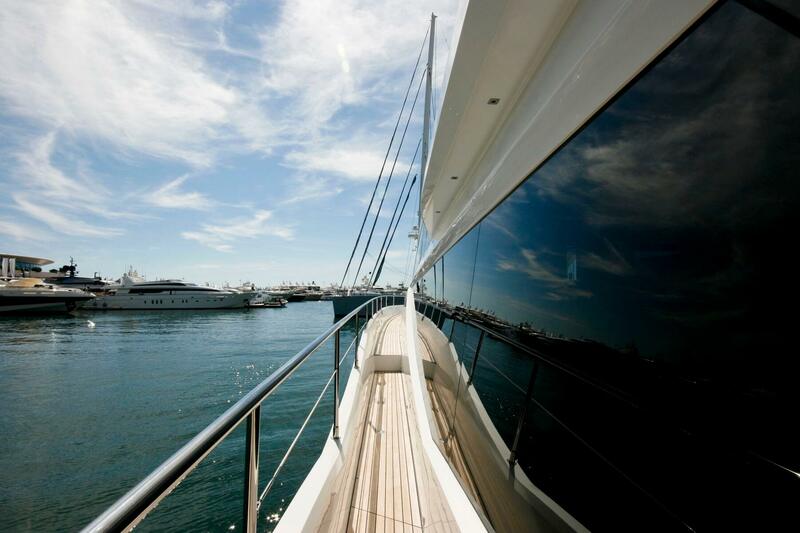 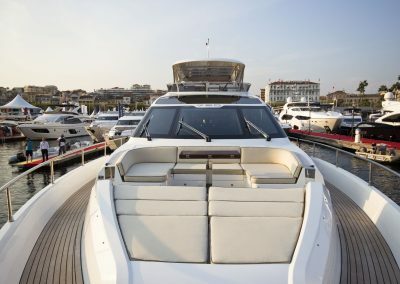 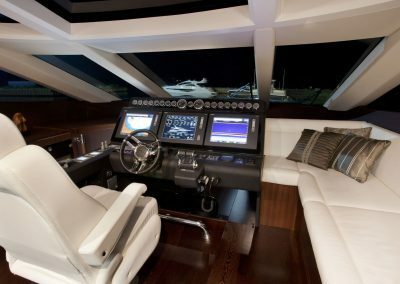 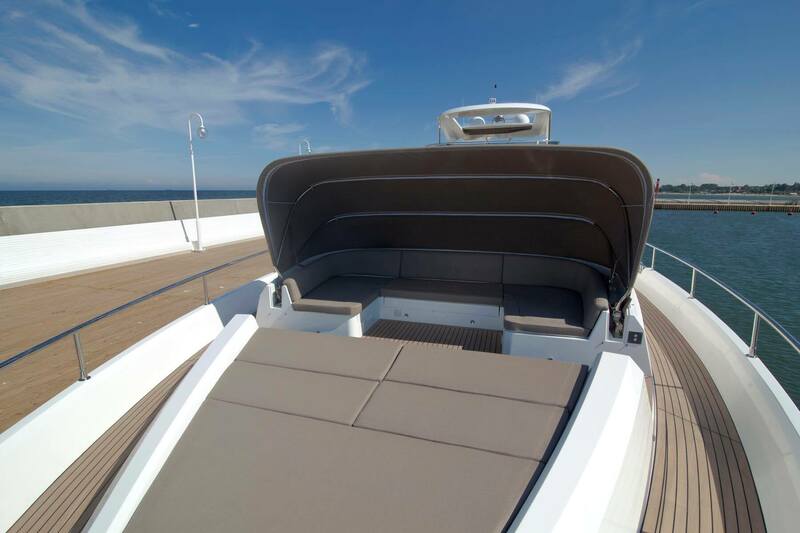 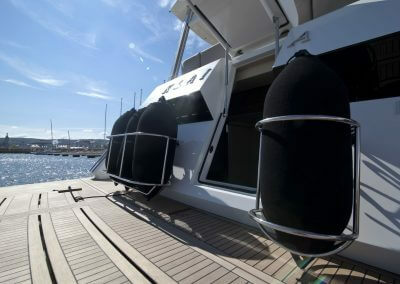 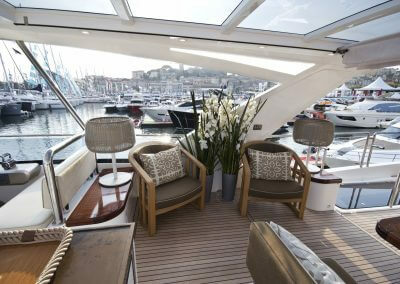 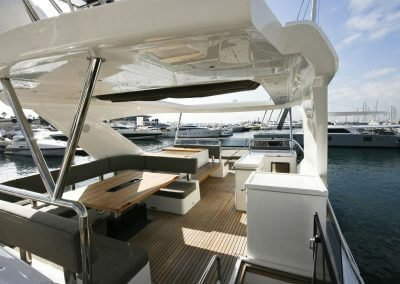 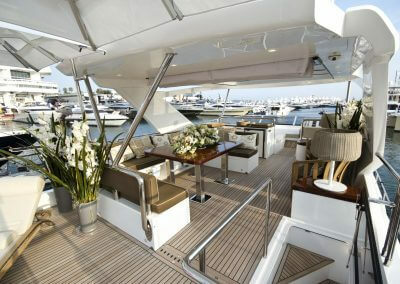 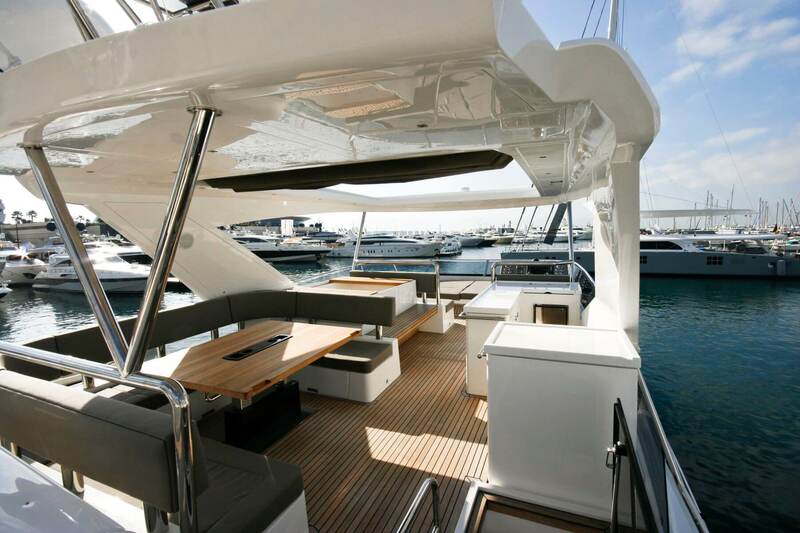 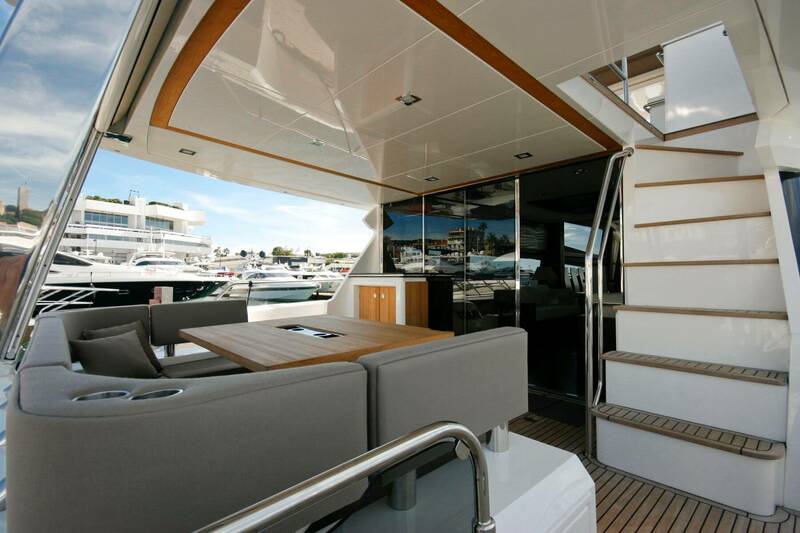 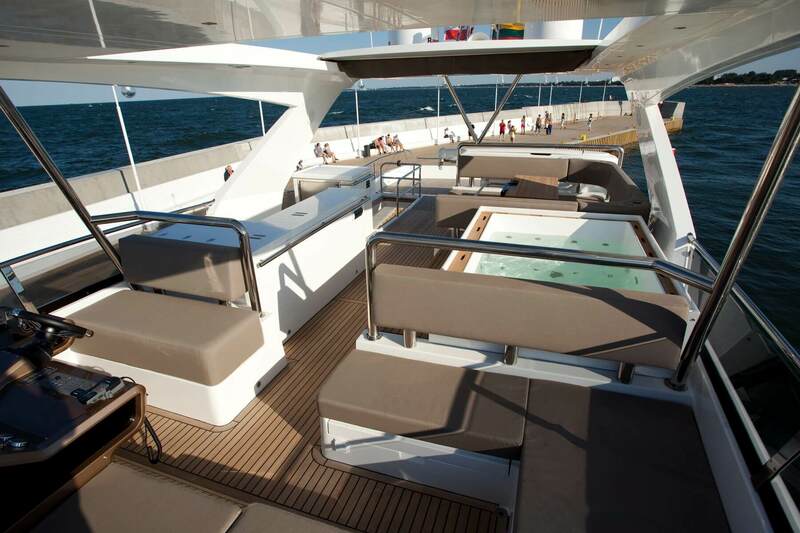 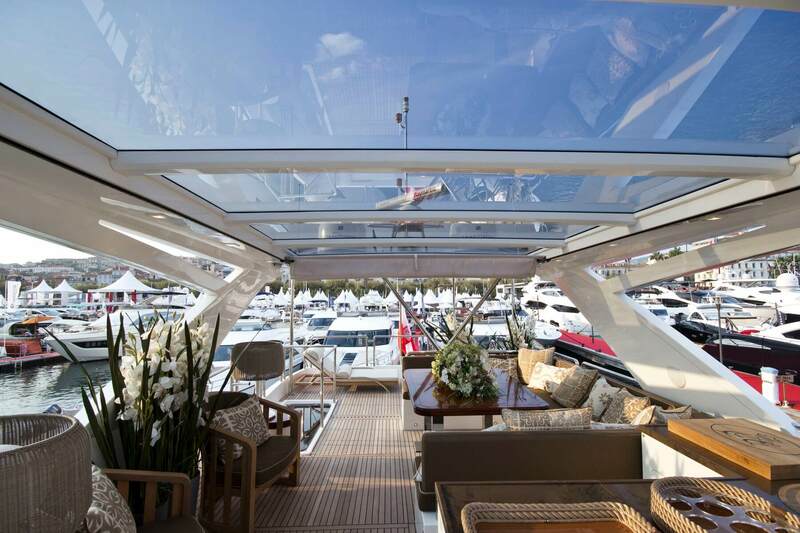 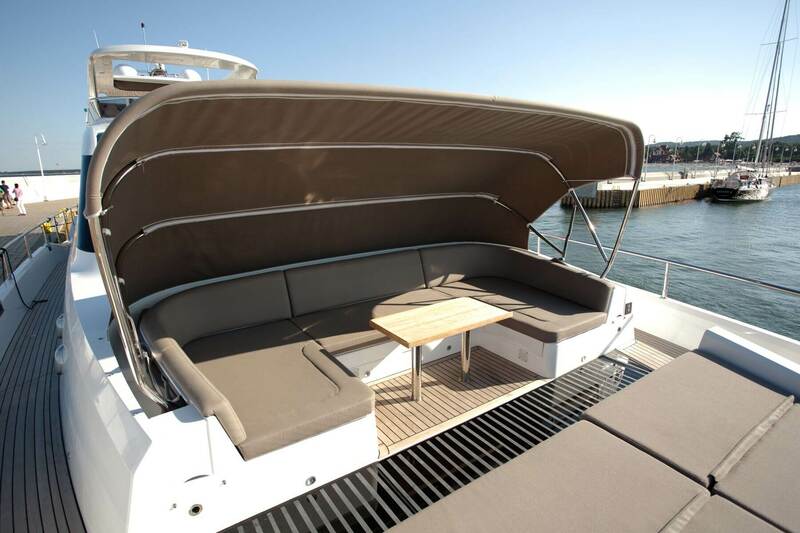 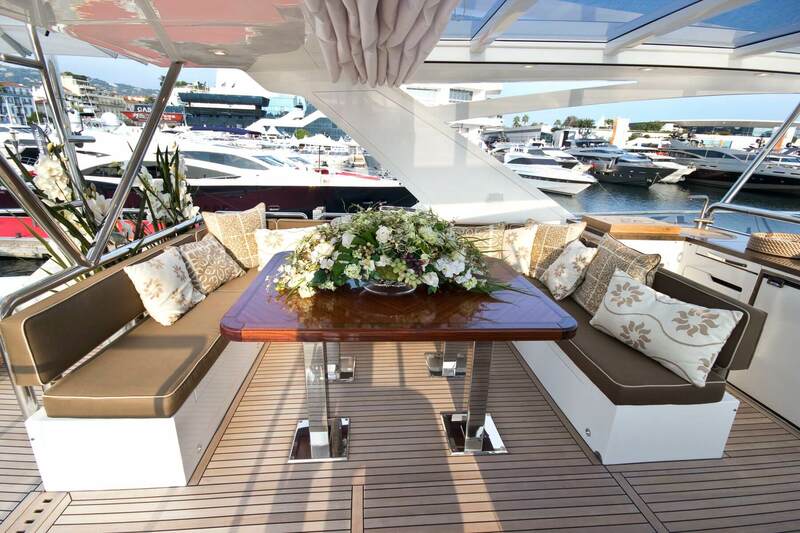 The cockpit offers easy access to the bar on the main deck and to the bow leisure area, which is protected by an automatic bimini system. 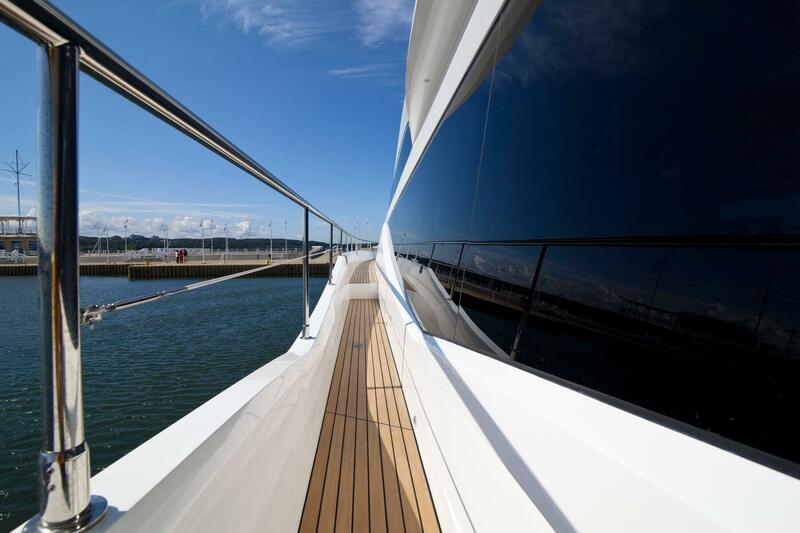 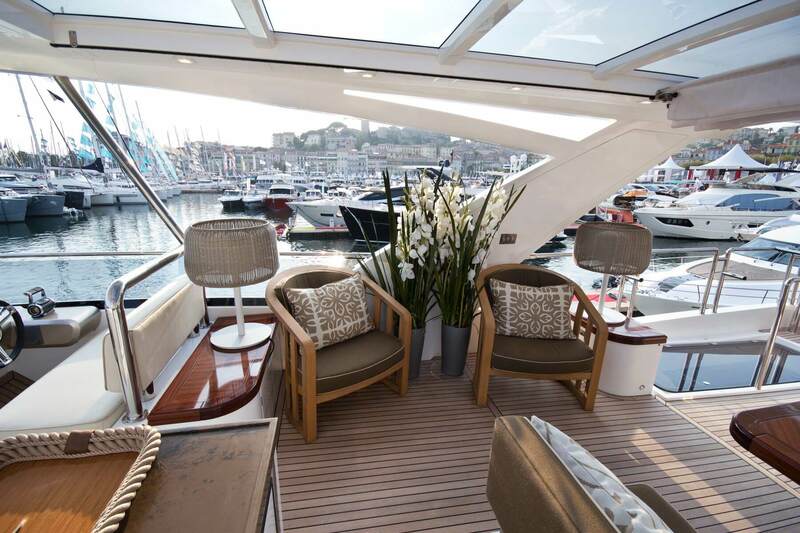 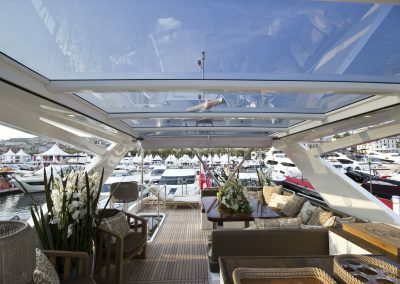 The main deck is always bathed in sunlight thanks to the broad side windows, large sliding doors and an automatic glass panel roof. 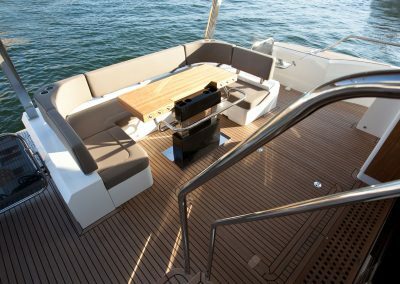 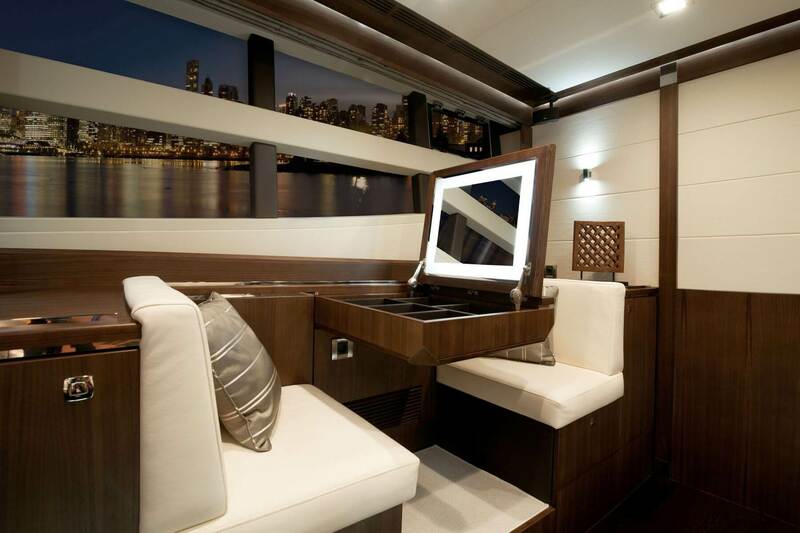 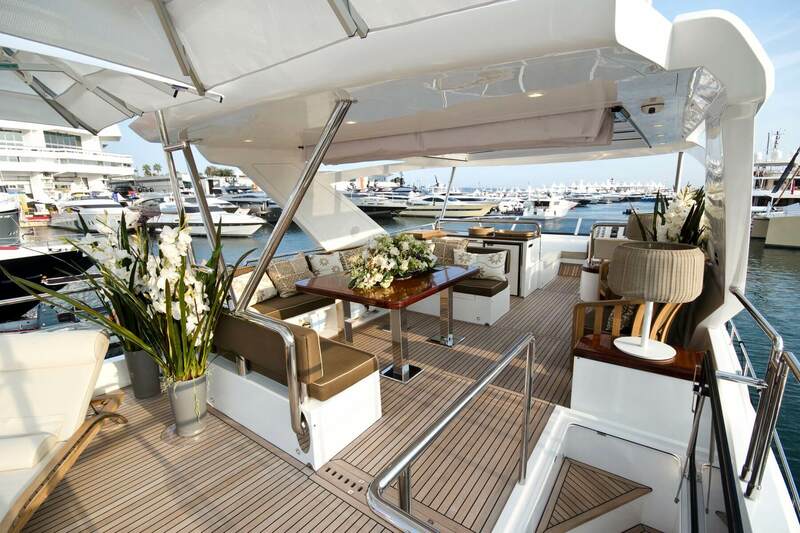 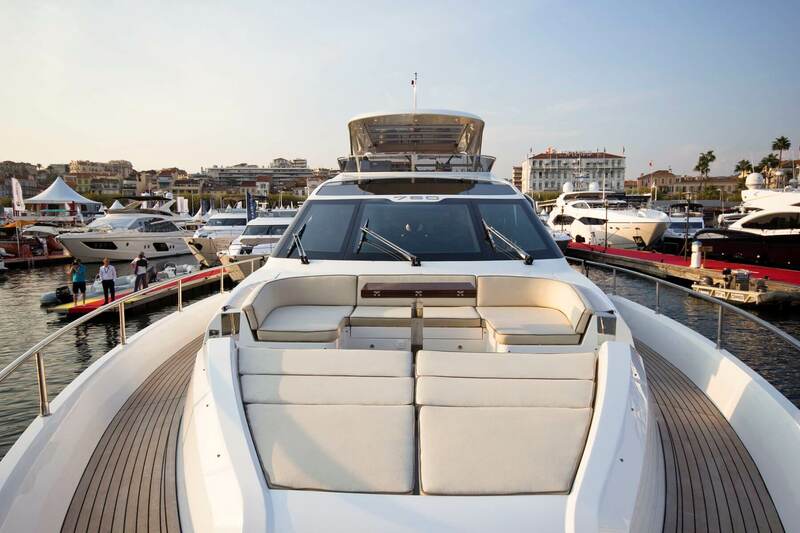 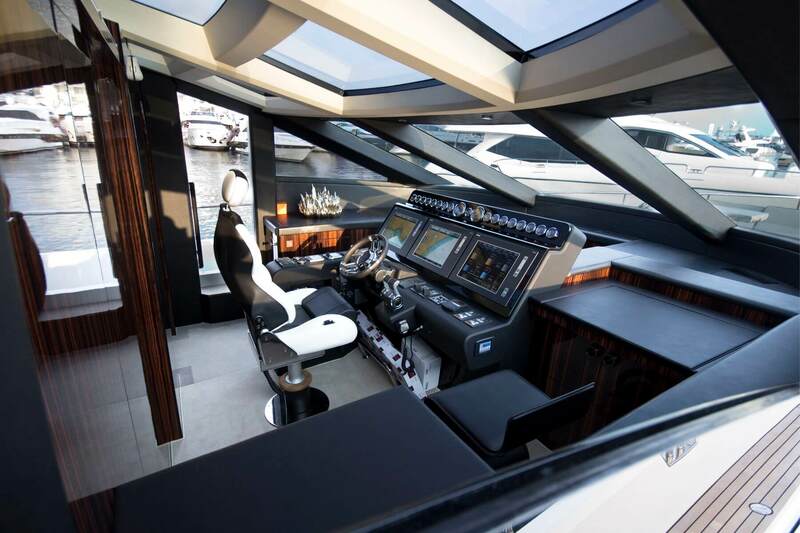 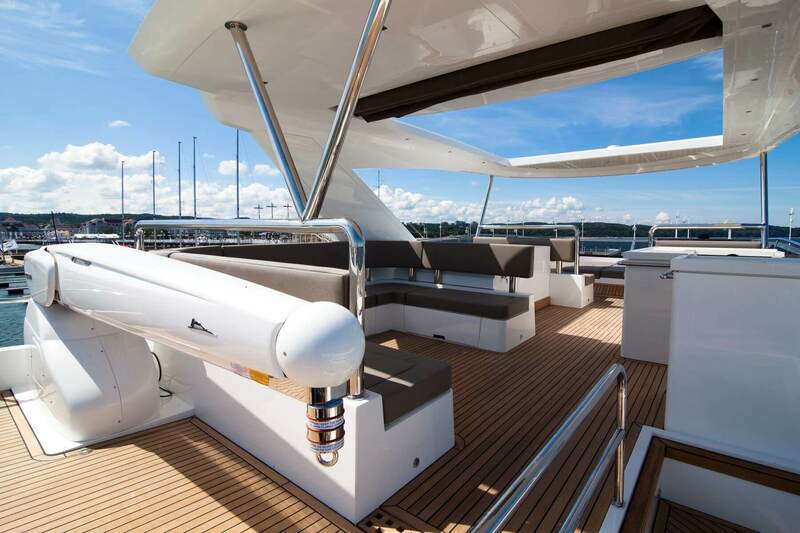 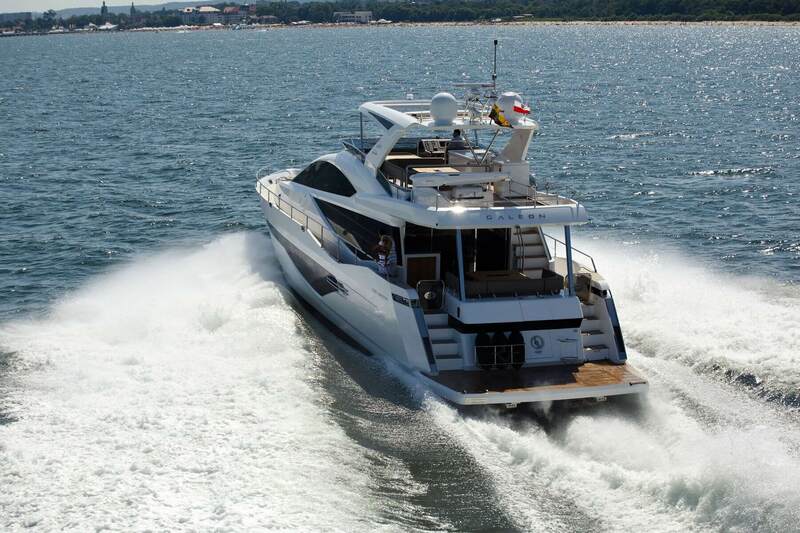 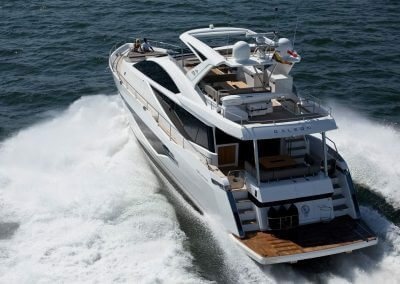 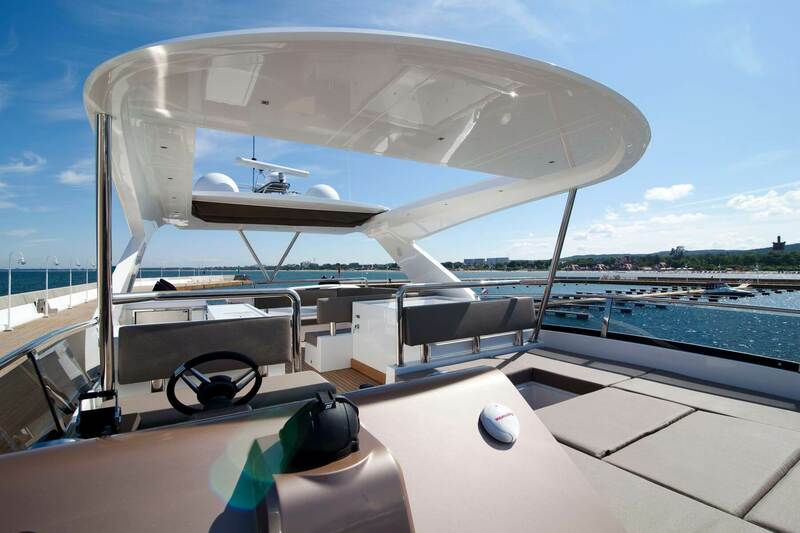 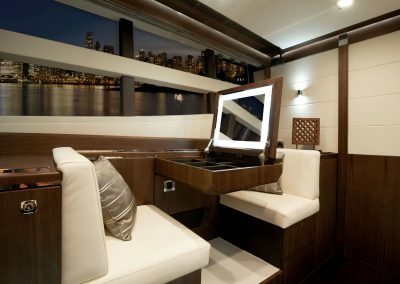 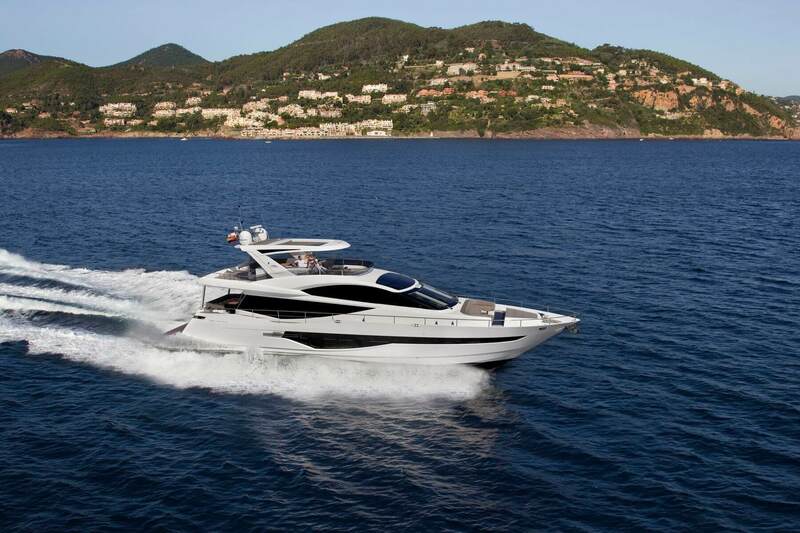 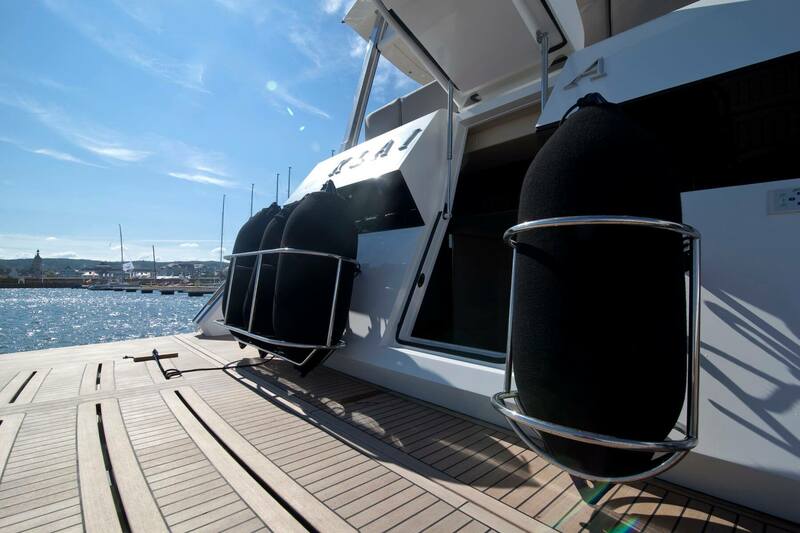 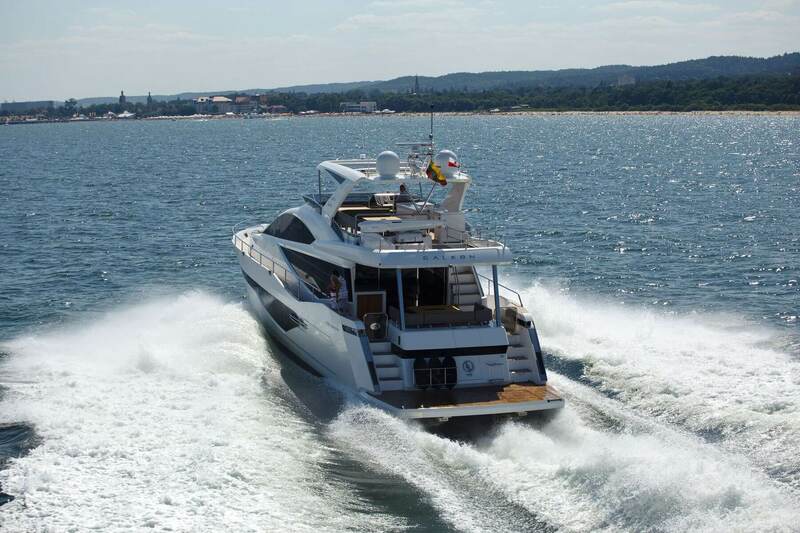 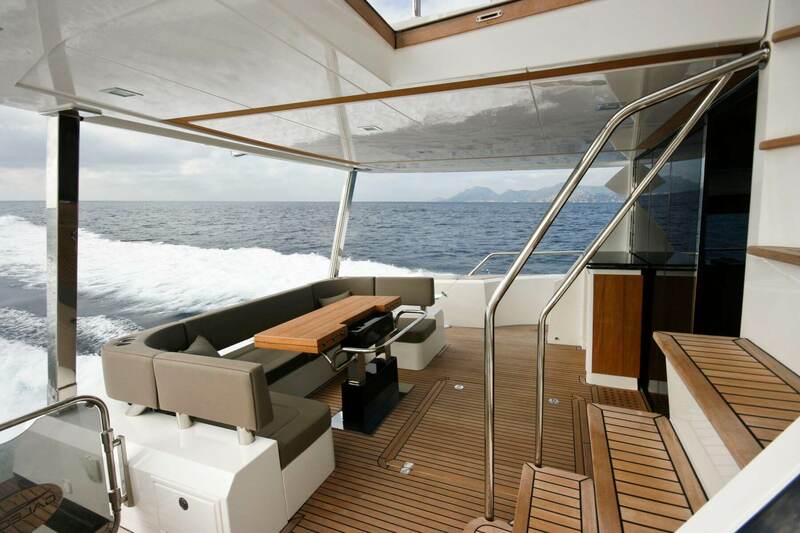 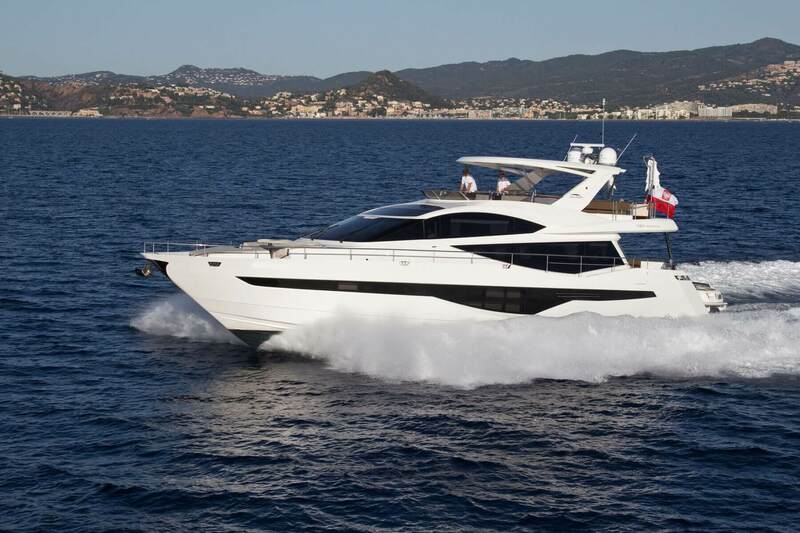 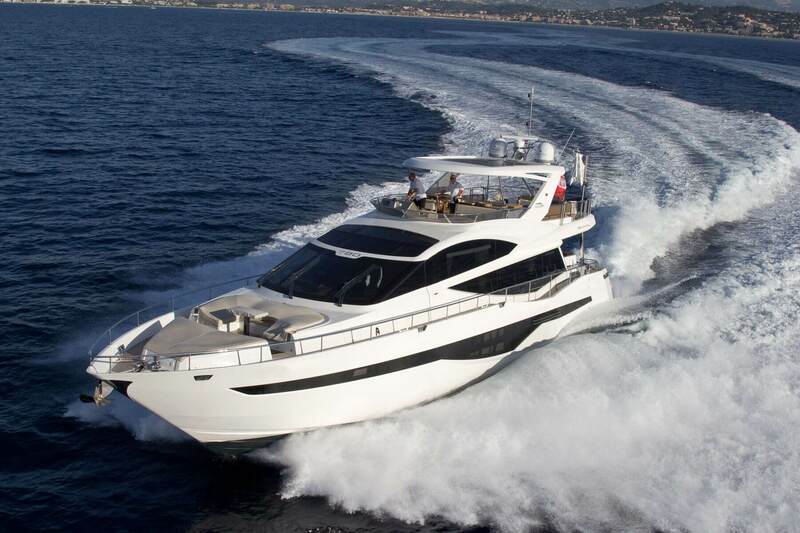 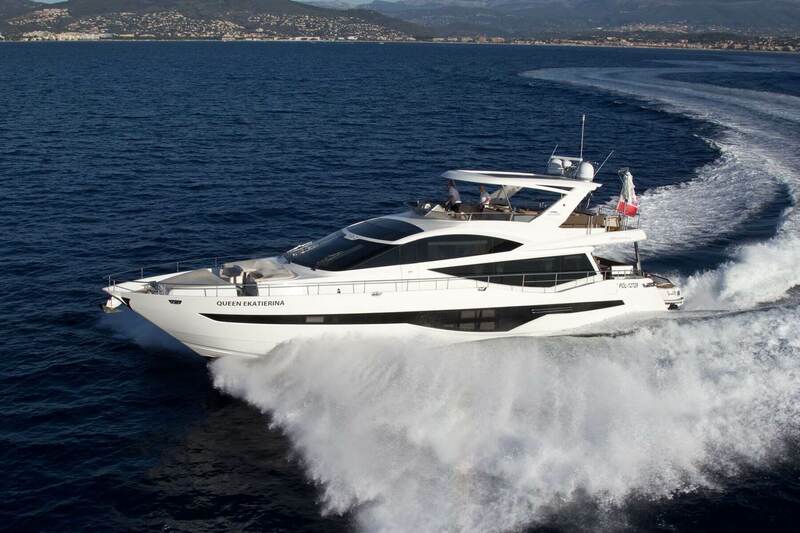 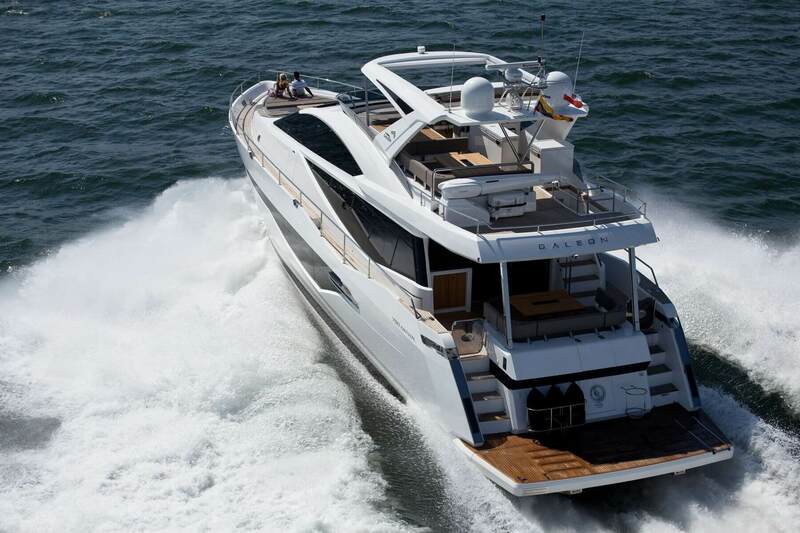 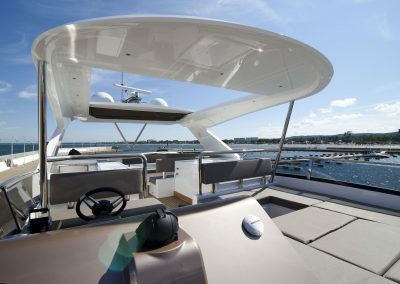 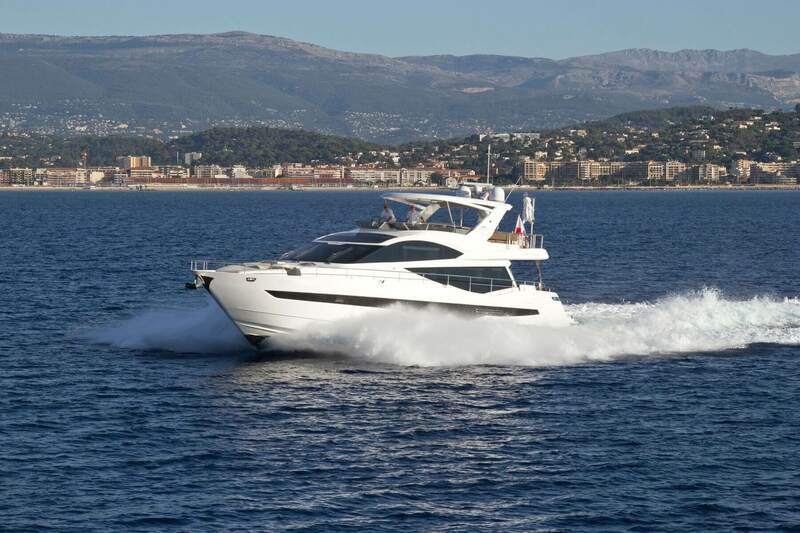 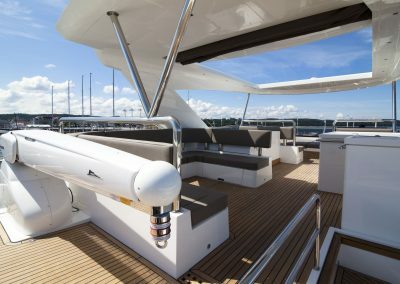 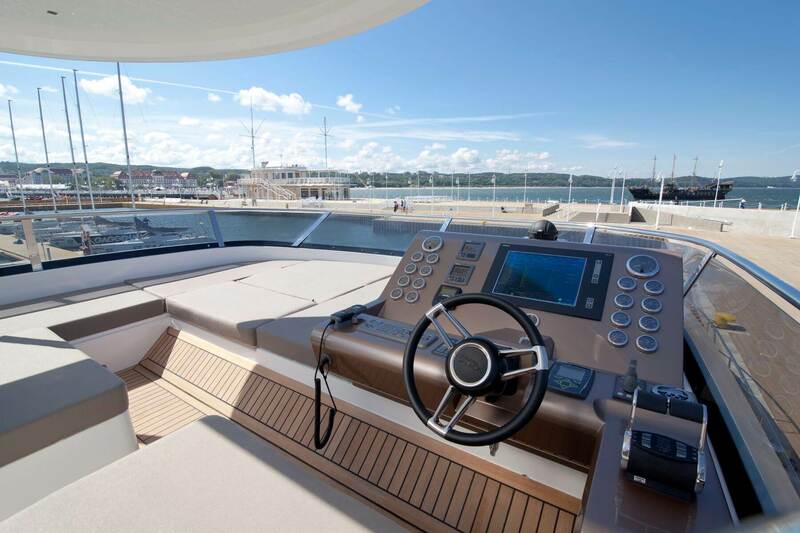 The saloon is divided into leisure and entertainment areas, while the helm station provides excellent visibility and functionality. 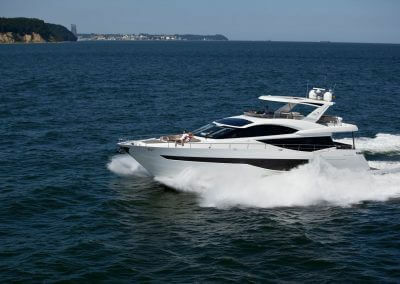 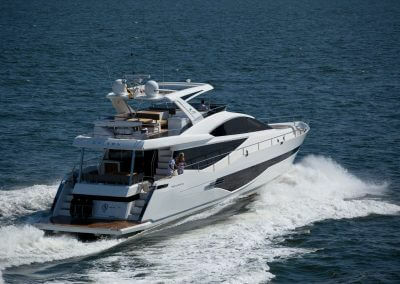 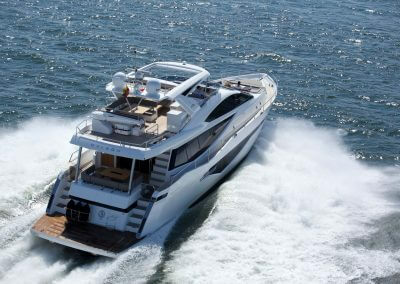 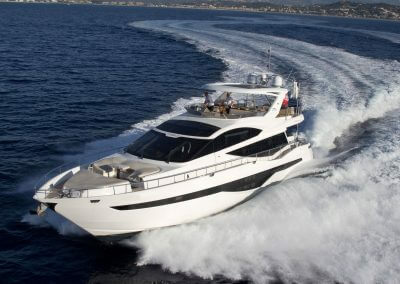 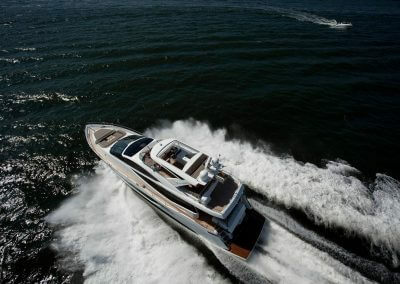 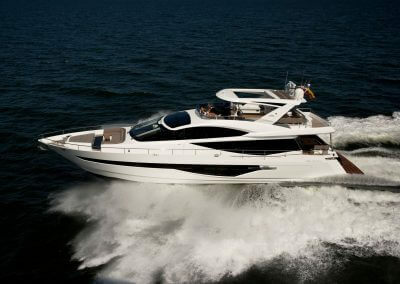 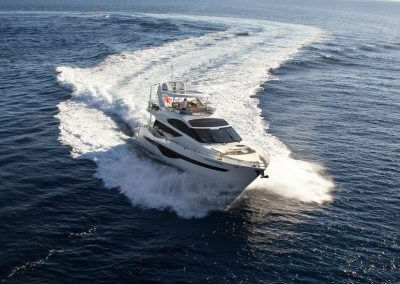 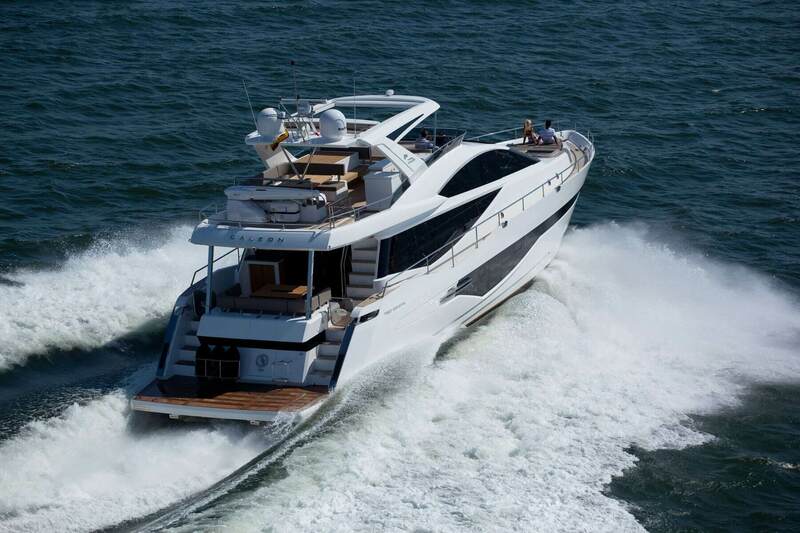 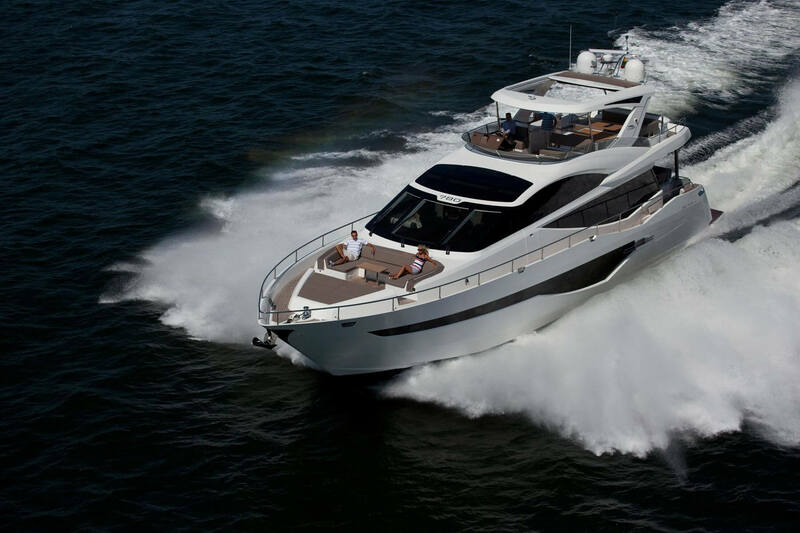 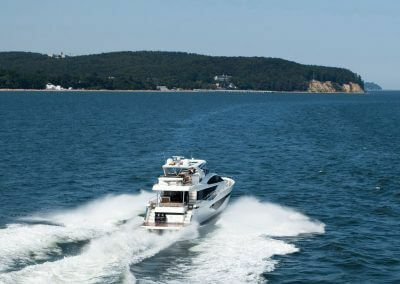 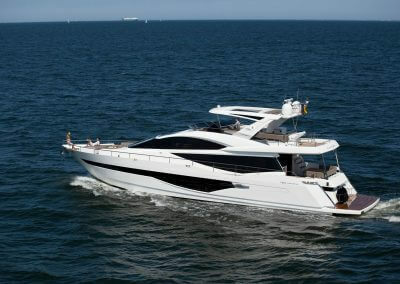 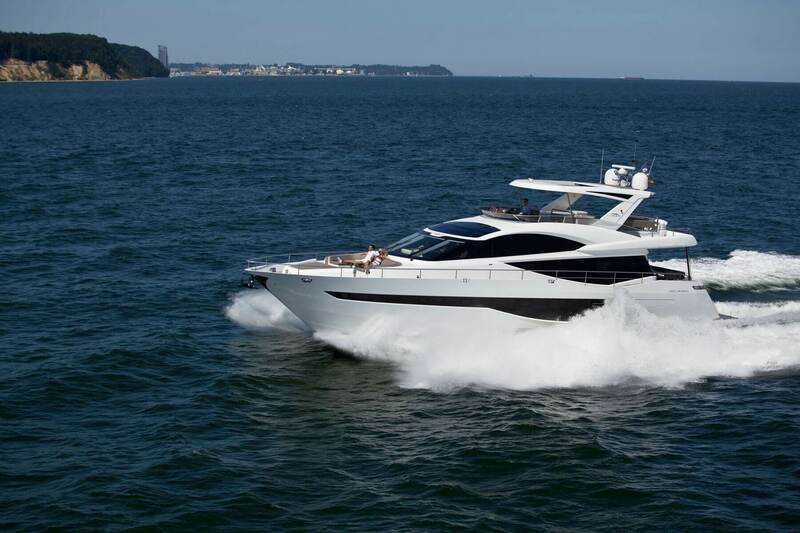 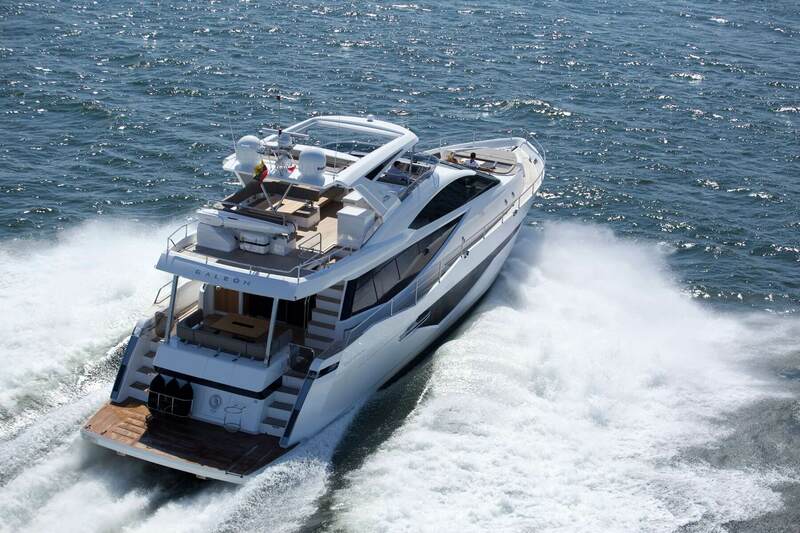 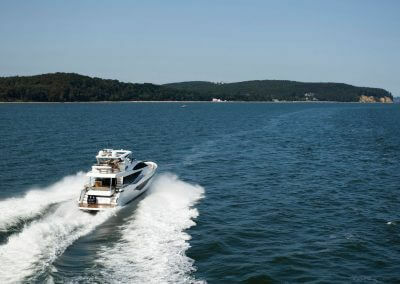 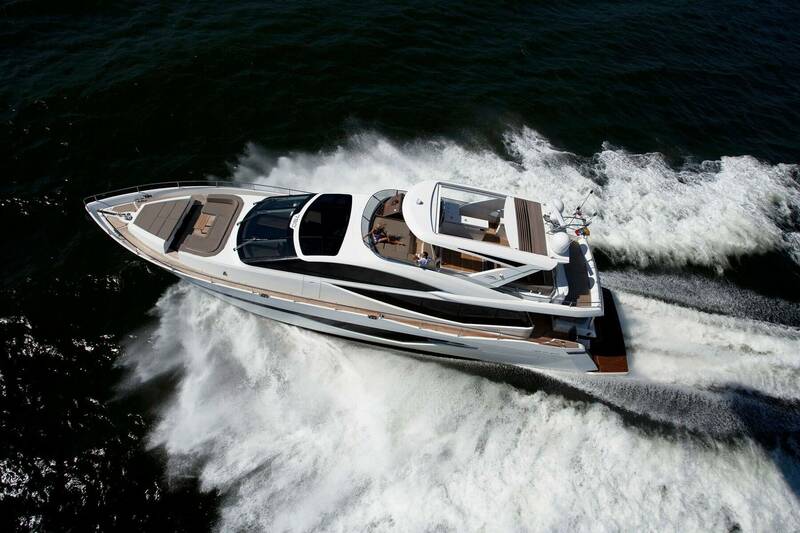 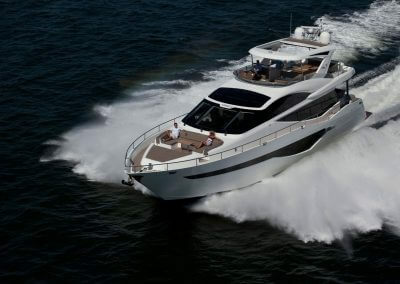 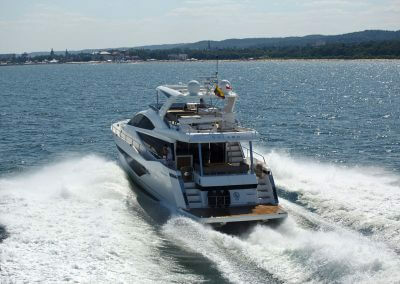 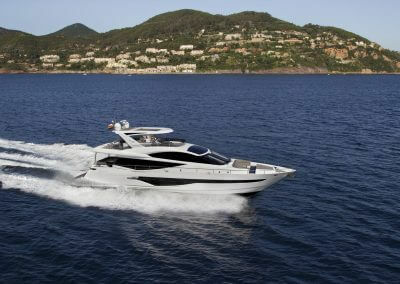 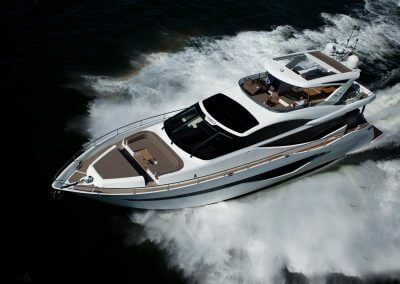 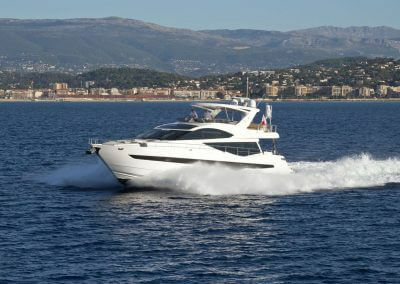 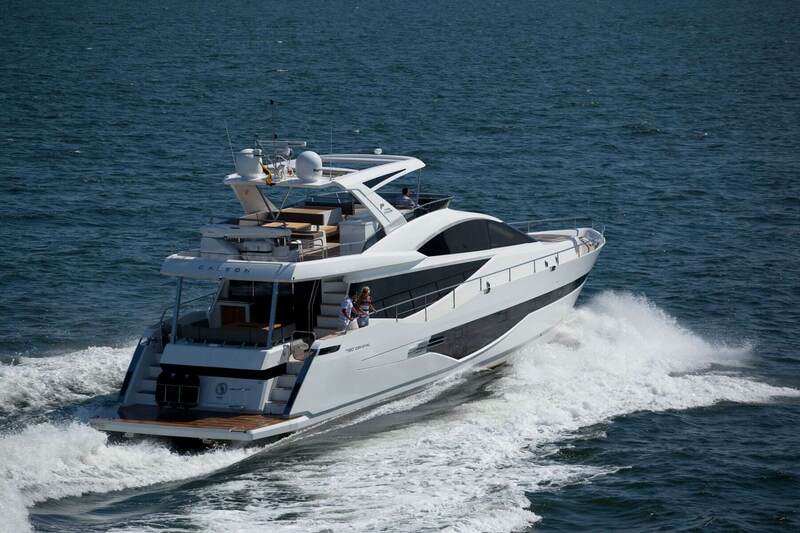 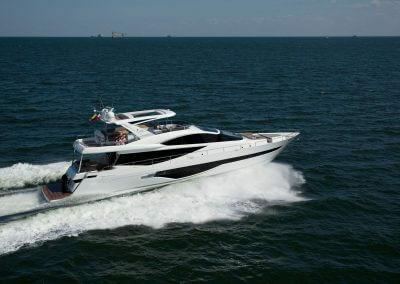 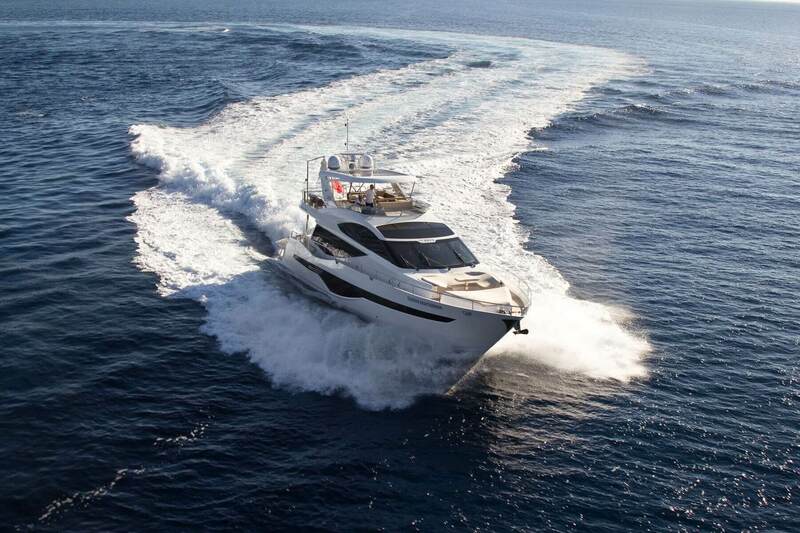 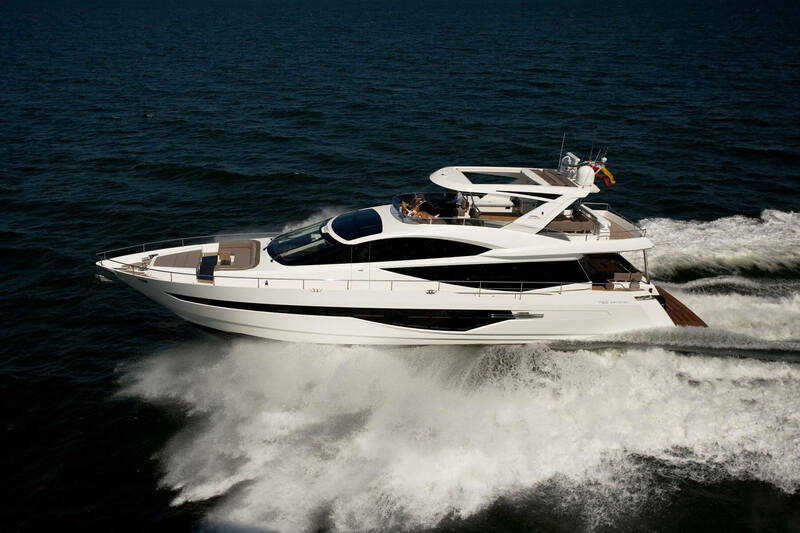 The hull is designed with comfort in mind yet the performance of the powerful engines is stellar. 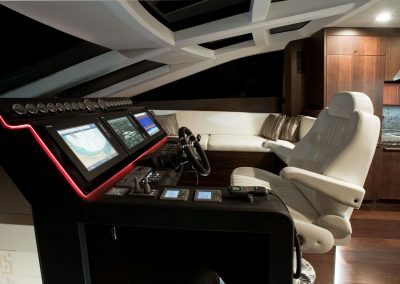 The captain will surely make use of the Böning integrated monitoring system, which keeps track of all the important data, while the crew will appreciate their quarters with two beds, a galley and a separate bathroom. 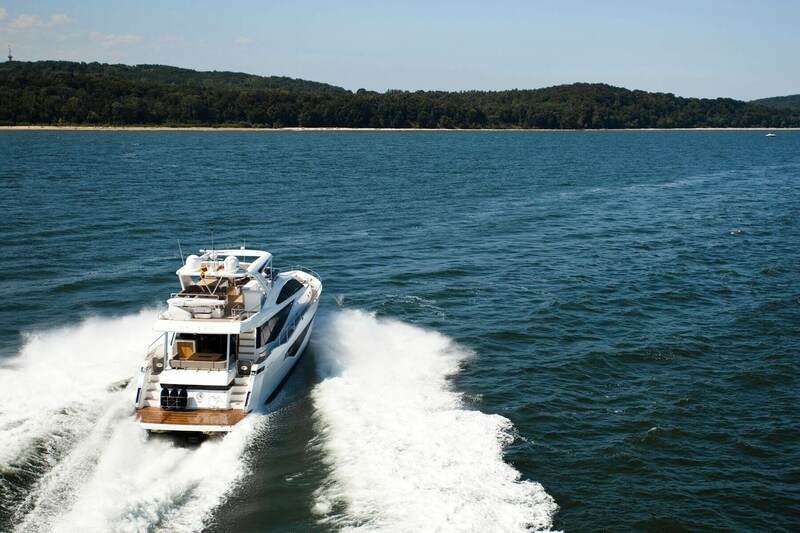 The powerful, hydraulic stern platform comes standard and will handle any watercraft.